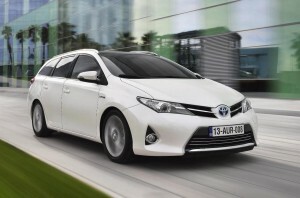 This is the new British-built Toyota Auris Touring Sports which is the latest addition to the impressive car’s range. It will also be the only hybrid estate car in the competitive C segment of the market. For its size there’s an incredible amount of space, in this case a class leading 1,658 litres. Mind you, there needs to be room in the back since the hybrid’s batteries are underneath the rear seats. Toyota say this car will broaden the appeal of the Auris and I think they could be right. The firm has had a rough time in recent years with product recalls but the cars built in the UK are generally of a high standard and reliable. This Touring Sports version will have the same selection of engines that other Toyota Auris models enjoy and a 1.8 litre hybrid unit which emits just 86g/km. Toyota is claiming that this engine is so well packaged that drivers will not notice the switch between petrol and electric power. British buyers will have the same engine options as the hatch, which are the 1.33-litre Dual VVT-i and 1.6-litre Valvematic petrol units; the 1.4-litre D-4D diesel as well as the full hybrid which has a 1.8-litre VVT-i petrol engine and an electric motor, giving a maximum power output of 134bhp/100kW. This enables acceleration from zero to 62mph acceleration in 10.9 seconds and a top speed of 112mph. The Auris Touring Sports shares the same front-end as the hatch and some versions of the model will be available with a Skyview panoramic roof – again it’s one of the largest such roofs in its class and will flood the car’s interior with light and create the feeling of more space. The new car will be unveiled at the Geneva Motor Show where Toyota is expected to unveil its bold ambition of claiming 5% market share in the C segment by next year. They will need to underpin this commitment with great cars with prices to match – and in the Toyota Auris, particularly this Touring Sports version, it appears that they have the necessary ammunition. If you’re looking to buy the Toyota Auris Touring Sports, then check out its leasing package costs and compare with what a dealership is offering. You might be surprised! This entry was posted in Car Updates & Releases, Family Car, New Cars, Sports Car and tagged auris, Auris Touring Sports, car, electric motor, electric power, family car, Geneva Motor Show, GM, Hybrid, impressive car, LS, LV, MoT, New Toyota Auris, New Toyota Auris Touring Sports, price, seat, speed, Sport, toyota, toyota auris, Toyota Auris Eco Car, Toyota Auris Estate, Toyota Auris Family Car, Toyota Auris Leasing, Toyota Auris range, Toyota Auris Touring Sports, Toyota Auris Touring Sports 2013, Toyota Auris Touring Sports Emissions, Toyota Auris Touring Sports Spec, Toyota Auris Touring Sports Speed, Toyota Car Leasing, UK, VVT by Steve Lumley. Bookmark the permalink.